April 6, 2018, 11:47 AM · How often do you perform for an audience? And when I say that, I don't mean "How often do you perform at Carnegie Hall"? Performing for an audience in a more "low stakes" situation can be remarkably satisfying, as Karen Allendoerfer pointed out this week. And frequent performing usually leads to more ease in performing overall. The key is to find frequent performing opportunities, which can mean busking, playing at retirement homes, playing in church, playing for relatives, etc. The more frequently you perform for people, the more comfortable you can become with the situation. For example, the Suzuki group that I teach with offers a recital time every single week, so that kids can frequently sign up to play their "currently polished piece" with piano, for the crowd of parents, teachers and other students that are gathered there. Performing frequently allows recitals and bigger concerts to become just one of many performances, something more routine. If you perform very infrequently, than those rare performances can take on a "scary big deal" type of character! Even veteran professional soloists encourage these kinds of "practice performances" - for example, the great violinist Midori has talked about playing her recital programs for residents of retirement homes in order to prepare for professional appearances; and she has her students do the same. Do you regularly perform for an audience? And how do you find these performance opportunities? Are you part of an orchestra that plays quite frequently? Do you busk or play for retirement homes? Or is performing something you prefer to avoid? Please participate in the vote and then share your experiences in the comments below. Do you regularly perform for an audience? April 6, 2018 at 08:37 PM · I perform around 7-10 times a year (never really counted). I'm including ensemble performances too. I love performing, and take every opportunity to do so, and even make my own. I voted "I perform every few months". In reality, in some months (e.g December and June), I perform several times a month, but there are months in which I don't perform at all. April 6, 2018 at 09:53 PM · Several times a month -- actually, just about every day when it's warm enough -- as it is here about 8 months each year. The garage is one of my top favorite places for low-stakes performance. I can have a different audience each evening, playing things I polished in the past. Other favorite venues of mine are gym floors and church auditoriums during off-hours, when they're not in use for other activities. A number of people have hung around to listen. Some have asked questions -- e.g., "When did you start playing?" Probably the most frequent question, typically from guitar-players: "How do you know where the positions are?" One kid wanted to try out my instrument. He was about 6 y/o then -- the 4/4-size fiddle was a little big for him. He'd be around 12 now and could probably handle it. A neighbor down the street told me that her son, about 18, the classic school jock type, would sometimes pause to listen for a few minutes before getting into his car to head into town. My schedule, at least for now, rules out retirement homes and Farmers Markets. But down the road, who knows? April 7, 2018 at 03:58 AM · I perform in between several times a month and every few months: about 1X per month, maybe twice in a busy month. I also read chamber music 3-4X a month. This isn't really a performance but it's halfway there because I have to learn my part and play it through with others listening. April 7, 2018 at 08:33 AM · I average about 15-20 times a year. Two orchestras that perform 10 times a year in total, I've recently started going to summer chamber music workshops that involve 5 performances in 5 days, and other occasional one-off events. April 7, 2018 at 01:21 PM · I play in a Ceilidh Band, so I'm out playing most Saturday evenings, sometimes on a Friday as well. I also go to 'sessions', some Folk and some Gypsy Jazz mid week, and run a Fiddlers Society which meets once a month. Where I live, Sheffield UK, there are many possibilities for playing music of various kinds, several amateur Orchestras, lots of music sessions, open mic nights and folk clubs as well as many live music venues. People move here just for the music! April 7, 2018 at 10:38 PM · Do you perform your twelve tone stuff when you busk? Brave man! April 9, 2018 at 05:16 AM · I was thinking only a few until I started adding them up and was surprised at how many times I'm out there - usually with groups of anywhere from 4-25 people. (not including jams where there are audience/listeners). April 9, 2018 at 06:24 PM · I am pretty sure the intent of this article is concerning violin? 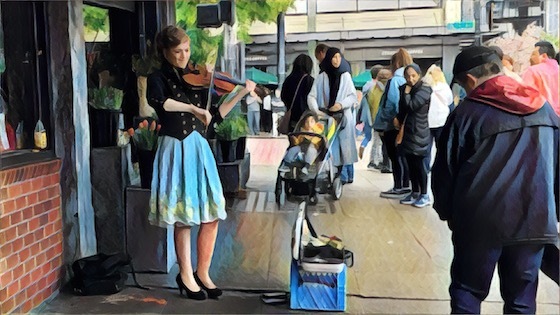 I am a beginning violinist so I only play it out maybe once or twice a month, usually in bars playing Irish folk music. Being a church music minister and leader I play to that same crowd every week mostly piano and vocals. If you want a real challenge try playing to the same crowd every week and try to keep it interesting for them :-). I don't see either case as a performance in the technical sense of that word. Both cases are communal. In the first I'm mainly a facilitator. In the second I'm just another player trying to fit in. April 9, 2018 at 09:13 PM · I hate to admit this, but I seldom perform for the very reasons that are mentioned in the article, because performing feels like a "scary big deal"! I know all of the reasons why I don't. Crazy thing is, I've been playing violin for a while now (25+ years), and while I used to play in front of audiences (high school orchestra, duets, and a short-lived quartet), I can count on one hand how many times I've played in front of an audience for the last 10 years. It's more a mental hiccup than anything else for common reasons. A bouncing bow, a lack of technique, a limited repertoire, freezing up when I get to a difficult part in a piece. Thanks for the reminder in this article that by performing more frequently, those jitters can go away. I'm NYC-based, so if anyone knows of any music groups I could participate in or has a recital schedule, please mention it in the comments! At this point I need group support; not ready to perform or busk alone quiet yet. I need to start somewhere!